replacing [REGION] with the region you are using for your service. replacing [CLUSTER] and [CLUSTER_LOCATION] with the name and location of the cluster you are using. If you develop for BOTH Cloud Run and Cloud Run on GKE, you cannot set the properties as described above, because they will conflict. Instead, supply the --region parameter as needed in the gcloud command line for Cloud Run , and supply the --cluster and --cluster-location parameters as needed in the gcloud command line for Cloud Run on GKE. Cloud Run is regional, which means the infrastructure that runs your Cloud Run services is located in a specific region and is managed by Google to be redundantly available across all the zones within that region. Meeting your latency, availability, or durability requirements are primary factors for selecting the region where your Cloud Run services are run. You can generally select the region nearest to your users but you should consider the location of the other GCP products that are used by your Cloud Run service. Using GCP products together across multiple locations can affect your service's latency as well as cost. If you already created a Cloud Run service, you can view the region in the Cloud Run dashboard in the GCP Console. You can use a custom domain rather than the default address that Cloud Run and Cloud Run on GKE provide for a deployed service. To use a custom domain for a service, you map your service to the custom domain, then update your DNS records. You can map a service to a domain, such as example.comor to a subdomain, such as subdomain.example.com. For Cloud Run, a managed certificate for HTTPS connections is automatically issued when you map a service to a custom domain. Note that provisioning the SSL certificate should take about 15 minutes. You cannot upload and use your own certificates. For Cloud Run on GKE, only HTTP is available by default. You can install a wildcard SSL certificate to enable SSL for all services mapped to domains included in the wildcard SSL certificate. For more information see Enabling HTTPS. Purchase a new domain, unless you already have one that you want to use. You can use any domain name registrar, but if you use Google Domains, the domain is automatically verified for Cloud Run, so you won't have to go through the domain verification process. You can use the gcloud command line to map a custom domain to a service. Note that if your display window is too small, if you navigate to the Domain Mapping page from the main Cloud Run page, the Mapping Custom Domains button isn't displayed: you have to click the 3-dot vertical ellipse icon at the right of the page. In the Domain Mapping page, click Add Mapping. Update your DNS records at your domain registrar web site using the DNS records displayed in the last step. You can display the records at any time by clicking DNS Records in the "..." action menu for a domain mapping. where BASE-DOMAIN is the base domain you want to verify. For example, if you want to map subdomain.example.com, you should verify the ownership of example.com. In Webmaster Central, complete domain ownership verification. For more information, refer to Webmaster Central help. Replace [SERVICE] with your service name. Replace [DOMAIN] with your custom domain, for example, example.com or subdomain.example.com. You need all of the records returned under the heading resourceRecords. [IP_NAME] with the name you want to give your static IP. [REGION] with the region you are using. 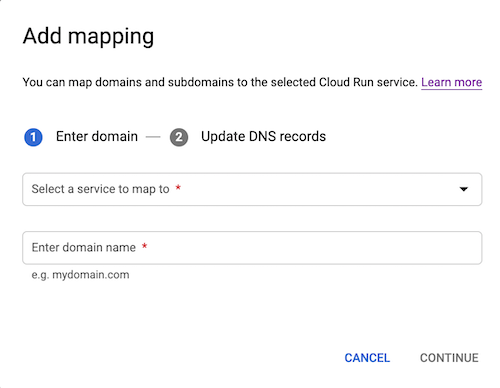 After you've mapped your service to a custom domain in Cloud Run, you need to update your DNS records at your domain registrar. As a convenience, Cloud Run generates and displays the DNS records you need to enter. You must add these records that point to the Cloud Run service at your domain registrar for the mapping to go into effect. Locate the host records section of your domain's configuration page and then add each of the resource records that you received when you mapped your domain to your Cloud Run service. Select the type returned in the DNS record in the previous step: A, or AAAA, or CNAME. Use the name www to map to www.example.com. Use the name @ to map example.com. Save your changes in the DNS configuration page of your domain's account. In most cases, it takes only a few minutes for these changes to take effect, but in some cases it can take up several hours, depending on the registrar, and on the Time-To-Live (TTL) of any previous DNS records for your domain. Test for success by browsing to your service at its new URL, for example http://www.example.com. Note that if you are testing with https:// in Cloud Run, it can take several minutes for the automatic SSL certificate to be issued before you can successfully use https://. When a user verifies a domain, that domain is only verified to that user's account. This means that only that user can add more domain mappings that use that domain. So, to enable other users to add mappings that use that domain, you must add them as verified owners.